Well, the jury is still out but all early indications are definitely YES! The old Nikon Series E lenses, the compact, cheap-but-sharp, E-for-economy lens line Nikon made back in the 80’s, are in many ways the perfect complement of manual focus lenses for the Old Man in Motion, who, as you know, is interested in gear that does the job admirably, but is smaller, lighter, (and cheaper). When the Sony A7s burst onto the scene, it presented a bit of a dilemma for me. Sure, I had to have this low-light video shooting monster…12 megapixels of moire -free, artifact-free video goodness that can shoot in the dark. Up to this time, I had been using my Sony RX10, with its one inch chip and built-in 24-200mm f/2.8 Zeiss, as my “shot-getter,” and switching to the APS C sized A6000 for my ultra-wide work, and my work with faster primes for that delicious bokeh. The Fotodiox Vizilex ND Throttle solves a big problem for folks adapting old lenses to mirrorless cameras…it has a 2-10stop Variable ND filter built right in, so you don’t have to add an ND filter to the front of the lens. Ingenious! It was a nice combo and I was happy. But when a game-changing camera like the A7s comes along, one that allows you to shoot great looking video in dark conditions (remember, still shooters…1/50th of a second is our bottom shutter speed in the video game, which is why videographers are always drooling for f/.95 lenses and other optical arcania), I had to go. Now you can use the A7s in APSC mode with all the Sony lenses (and their nice OSS Optical Image Stabilization and fast autofocus) in video mode with virtually no loss of quality (in fact, the effects of rolling shutter are even lessened a bit). But when it came to really low light, or if you really wanted very soft bokeh, you needed to go full frame. Likewise for shooting stills…in APSC mode, you’re only using maybe 7 of the 12 megapixels, and that’s a tad low, even for me, someone who’s never been overly concerned with the megapixel race. 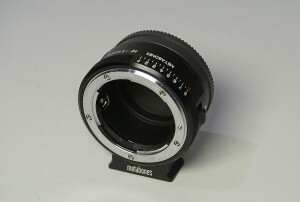 The Metabones adapter has a tripod collar with an Arca Swiss plate built in…nice! The old Nikon Series E line (they didn’t even give them the coveted “Nikkor” designation) were appreciated by those of us who needed to travel light, even back in the manual focus film days. I used to use the 50 and 75-150mm a lot but I was kind of embarrassed to admit it until the late, great Galen Rowell began singing their praises in Outdoor Photographer. Then, it was easier for the rest of us to come out of that Series E closet:-). To adapt them to my Sony, I usually use a Metabones adapter…very well made and it includes a built-in Arca Swiss QR plated tripod mount, which is great and provides good balance on longer, heavier Nikkors as well as the 70-150mm above. But I am also experimenting with the Fotodiox Vizelex ND Throttle adapter, because, hallellujah, it has a variable ND filter, 2-10 stops, built right into the adapter! So outside in bright light, you don’t have to be screwing ND filters onto the front of each lens to get your desired aperture, because it’s in the adapter (in low light, of course, you use an adapter like the Metabones that has no ND at all). It’s a pretty ingenious system and so far, I don’t see any bad issues with sharpness, but I’m still testing. Are the Series E lenses as rugged and well made as the Nikkors? No. 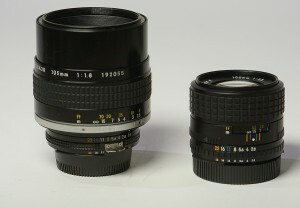 The 105mm f/1.8 Nikkor and the 100mm f/2.8 Series E…I love them both, but for different reasons! Are they pretty damn sharp, half the size and weight of equivalent Nikkors, and can you usually pick them up for under a C-note? Yes! (And I don’t know about you, but my mountain climbing days are long over, and while I don’t baby my gear, these were made back in the 80’s, when everything was built like a tank, so they do fine by me). I’ll probably still shoot the majority of my A7s video work in APS C mode with the Sony E glass, but I’ll throw the Series E stuff in the suitcase for those occasions when I absolutely, positively need to shoot full frame. They’re light enough, rugged enough and cheap enough to travel nicely wrapped up in the checked bag. Hi Bob. Still giddy at seeing you with SONY after watching my D90 intro DVD featuring you !!! I am personally using the a6000 after trading in the D800 for a few Zeiss lenses. My 28 and 50 E’s have been quite good. I picked up a somewhat damaged 50 last summer and was pleased to discover that it had just the right bokeh generating characteristics I wanted. ( https://flic.kr/p/ePwtcx ) I like to call them “happy” lenses. I’m on to “happy” because I couldn’t help note that most of my photos are rather serious, some even dark. While recovering from surgery and sepsis a few months ago it dawned on me that all of the art and photography in the hospital was also serious and dark, and from my perspective at that moment, not what I wanted to see. I’m on a bit of a campaign with some of the excellent local photogs to see if we can generate a “happy” portfolio for health care facilities. Thanks again. DL. Just purchased my Sony a7II. Love the camera, but already feeling that the lens selection, and the prices for those F4 lenses, is not great. This option interests me. Would you share which metabones adapter works with this lens/camera combo? I see three.. one that says Nikon G mount to Sony E mount, one same with ‘speed booster’, and one Nikon F to Sony NEX Mount Adapter II. Thanks for the info. Karen: Although it fits perfectly on any E mount Sony, including the full frame A7 series, The Metabones speed booster is designed for APSC sized bodies like the A6000, NEX7 etc. because it is a focal reducer and will give you the same angle of view on those cameras as you would get on a full frame. The other two have no glass, and work perfectly with the A7 series. I’m not even sure they’re making the Nikon F version but if you have an old fashioned Nikkor with an aperture ring, you get the F version. 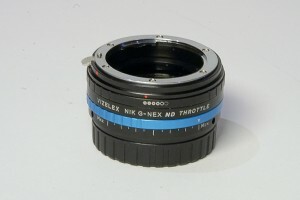 If you have newer G Nikkor glass, without an aperture ring, you get the G series. In reality, you can use the G series Nikkor mount with older (F mount) and newer (G-mount) glass, so that’s the one I would get. Nancy: I don’t know of anybody who really “needs” 36 megapixels, unless they shoot billboards on a regular basis. On the other hand, 12 megapixels of the A7s may not be enough. 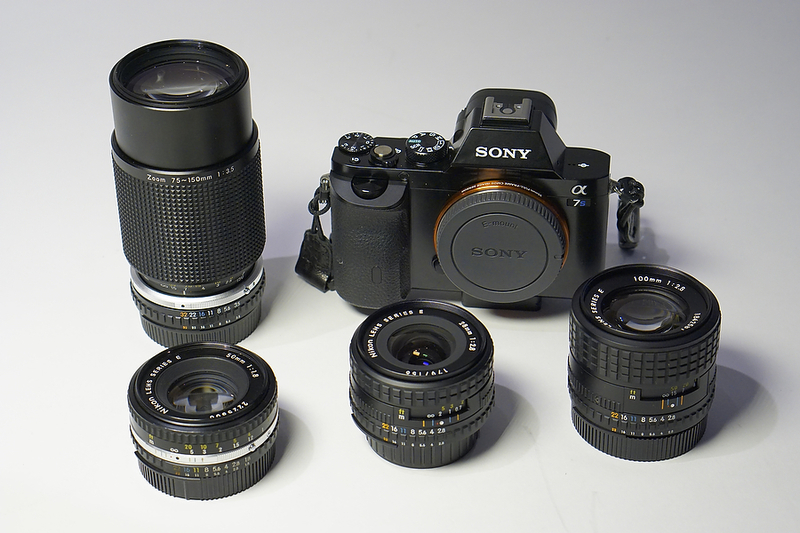 You may want to look right in the middle, at the A7 or even better, A7II, which I think is 16 or 24 mp as the ideal. If you were a journalist, the A7s would be the hands down choice, but for landscapes, maybe the A7. If you get the 36 megapixel model, you’ll need a faster computer, bigger hard drives, etc. Not a bad recommendation, based on what I have seen. The A7 (which I use) and A7r do not perform that well with rangefinder lenses. But the A7s apparently plays very nicely with them. Perhaps, cost aside, they are the perfect match for this camera (IMHO). I’m not a fan of Nikon lenses in general, but I definitely do like their older, cheaper lenses. For photographers, nobody needs (or has ever needed, now that I think about it) a 50/1.4 over a 50/1.8, so the slightly slower lenses are exceptional bargains and seem to perform much better. But that 105/1.8 (which I used to own) is a dog wide-open. You don’t get something for nothing. Even the Leica 50/1.4 M ASPH does not perform as well as the Zeiss Otus. But if you want quality, you have to pay for it in money and in size. Thankfully, digital cameras make it possible to go for quality and not worry about speed. Also, Nikon’s wide angle lenses exhibit too much distortion. It won’t affect a lot of photos but it will distract in some. Again, even the German lenses don’t always do well here. So we all need to do our homework. One thing is for sure: after a point, pixel count does not matter as much as more practical criteria such as highlight retention and good colour. P.S. I’d like to suggest a thought experiment (which of course can be tested): APS-C body with a Speed Booster? Or full-frame body with ‘slower’ lens? Which would be cheaper, given one’s needs? Which would deliver better quality images – if there is a difference? You said earlier you’re experimenting with the Fotodiox adapter with built-in ND filters. Have you come to any conclusions about this adapter? Do you like it? Certainly the built-in ND filter feature is pretty neat—and useful. Charles: I’ve done some testing, finally. Alas, these Vizelex adapters are a disappointment…too much impact on sharpness. I am pretty heartbroken, because this is an ingenious solution to multiple variable NDs. Maybe somebody will make a version with sharper glass, but these have too much impact on sharpness,IMHO. Dang! That A7s is sweet in available darkness. What a tool in good hands. Nice footage! Those series E lenses were the worst lenses I ever owned. An d they will retail that title right up to the day I buy one of those awfull Sony lenses.